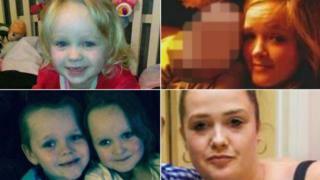 A third person charged with murder over the deaths of four children in a house fire in Salford has appeared in court. David Worrall, 25, of no fixed address, who has also been charged with arson and attempted murder, appeared before Manchester and Salford magistrates. He will appear at Manchester Crown Court on Friday, alongside Zak Bolland, 23, and Courtney Brierley, 20, both of Worsley, who face similar charges. Four siblings aged three to 15 died as a result of the blaze on Monday. Demi Pearson, 15, died at the scene on Jackson Street in Walkden. Her brother and sister, Brandon, eight, and Lacie, seven, died later in hospital. Three-year-old sister Lia died in hospital on Wednesday. Their mother Michelle, 35, is in a coma in a serious condition in hospital and unaware of their deaths. Mr Worrall spoke only to confirm his name, age, nationality and that he was of no fixed address. He is accused of four counts of murder, three counts of attempted murder and one count of arson with intent to endanger life. Mr Worrall, Mr Bolland and Ms Brierley have all been remanded in custody until the preliminary hearing on Friday. Both Mr Bolland and Ms Brierley were due to appear at the crown court on Thursday but their hearing was postponed.